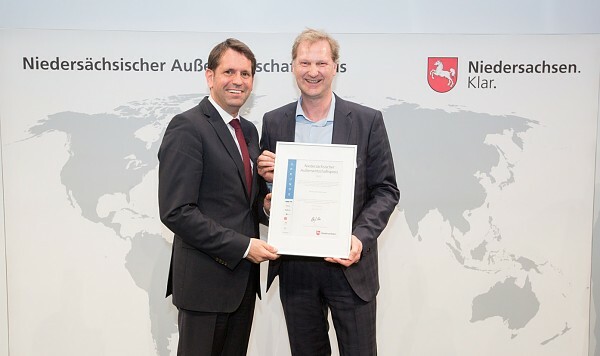 Lower Saxony Foreign Trade Award 2017: WELTEC BIOPOWER among the Top Five Innovative Drive Praised by Olaf Lies, Minister of the Economy „The ‚Made in Germany’ label is a special cachet and thus an export driver.“ With these words, Lower Saxony‘s Minister of the Economy Olaf Lies conferred the Lower Saxony Foreign Trade Award. The so-called „export Oscar of the North“ was awarded for the eighth time on 26 April 2017 at the Foreign Trade Conference held at the Hannover Messe, the world‘s largest industrial trade show. The German biogas plant manufacturer was pleased to be among the Top Five in the category of small and medium-sized enterprises (SME). The 10-person jury elected the winners from about 40 businesses, all of whom have delivered outstanding performance in the international competition. „The submissions were of a high quality and impressed me and the jury. By means of their overseas activities, all of the participating companies make a key contribution to the preservation and development of jobs in our federal state“, said Olaf Lies on the occasion of the award ceremony in the presence of 300 business representatives. WELTEC BIOPOWER had reason to be proud: „To be among the Top Five is an acknowledgment of our export strategy, which has run through our company history like a common thread ever since our foundation in 2001“, remarks Jens Albartus, Director of WELTEC. „We built our first biogas plant outside Germany back in 2003. Meanwhile, more than 300 WELTEC plants have been set up in 25 countries on five continents“, explains Jens Albartus. Profound quality awareness and attractive location conditions are important factors that support the export-oriented company‘s dynamics and success. The main steps of the value chain take place in North Germany and ensure a consistently high quality level for customers worldwide. The collaboration with energetic regional partners is instrumental in achieving global success with the „Made in Germany“ label. On this basis, WELTEC BIOPOWER constantly works on new, innovative products and optimisation approaches. Thanks to its good financial situation, the biogas specialist is also able to engage in research and development, thereby bolstering its position as one of the global market leaders.